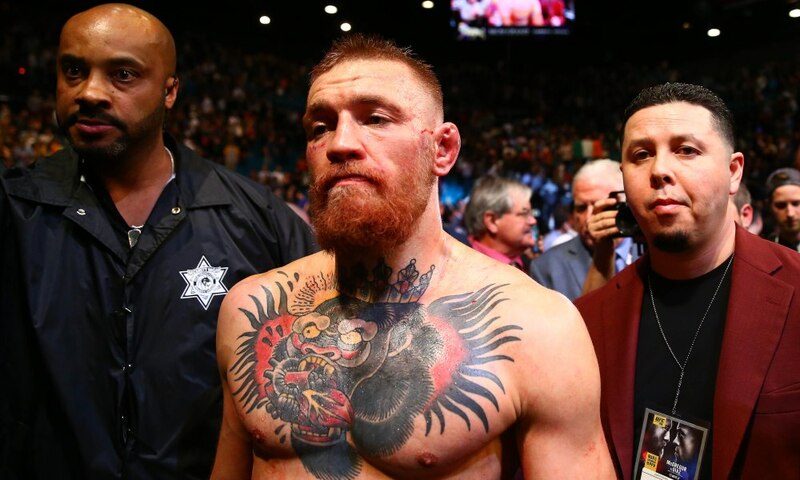 Conor McGregor turned himself in to police Thursday afternoon and was arrested and charged with three counts of assault and one count of criminal mischief after his role in a rampage that left UFC fighter Michael Chiesa in the hospital with cuts to the face. The incident took place after a media event ahead of Saturday’s UFC 223 at Barclays Center in Brooklyn. McGregor, was caught on camera throwing a hand dolly through the window of a bus. McGregor appeared in handcuffs Friday afternoon in a Brooklyn courtroom, where a judge set bail at $50,000 and set a court date of June 14. The judge also said McGregor, who is from Ireland, would be allowed to leave the country, according to reports. "No ... no," White said on ESPN's Get Up! on Friday morning when asked if he would help McGregor. "Normally, yes, I would dive right in and do everything in my power to help one of my guys. But not in this situation. He came into the Barclays Center, attacked our fighters and attacked my staff with a bunch of guys. No, you don't get my help on this one." We will have to see what happens with Connor McGregor and the UFC moving forward. Newer PostLakers Look to Spoil T-Wolves Playoff Hopes.. Older PostBeal, Wizards Go for Two Straight In Cleveland.